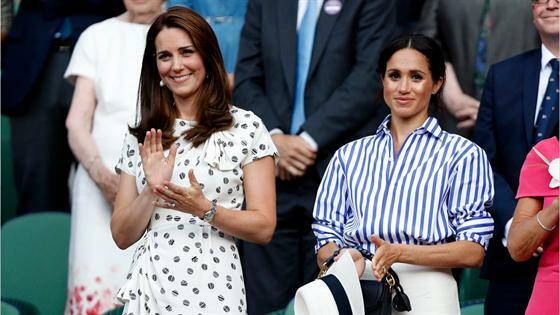 Meghan Markle isn't the only woman who wears the pants in the royal family. While visiting families of personnel during a visit to RAF Akrotiri in Cyprus with husband Prince William, Kate Middleton, Duchess of Cambridge, appeared to take a page from her sister-in-law's book and opted for a business chic look. Instead of her usual dress or dress coat, she wore an Army Green Smythe "Duchess" blazer over a cream top and dark flared wide-legged wool trousers, paired with pointed-toed black patent stilettos. Half of her hair was swept up. Kate has worn pants at public events before, but sparingly. A day earlier, she sported a traditional regal look at the annual diplomatic reception at Buckingham Palace: The duchess wore a glittering custom white Jenny Packham dress and the Lover's Knot tiara, which was a wedding gift to Princess Diana. Kate and William's visit to Cyrus comes amid mounting rumors of tension between the Cambridges and Prince Harry and his pregnant wife. Following the reports, it was revealed that the couples will spend Christmas together at Sandringham with Queen Elizabeth II and other royal family members.